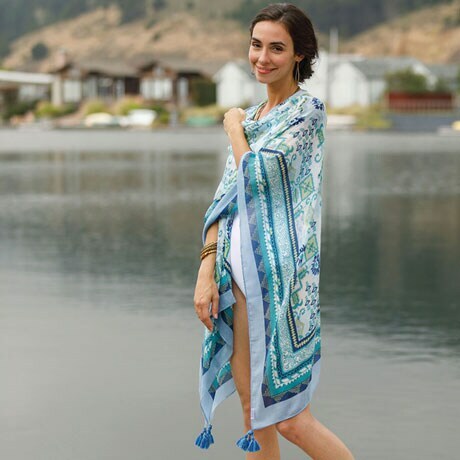 The Greek Islands may not be on your summer itinerary, but you can add their gorgeous Mediterranean colors to your warm-weather wardrobe with our Mykonos Ocean Kimono! The soft polyester-modal blend is light as air on hot summer days, yet surprisingly cozy in chilly air-conditioned rooms and on frigid airplanes. 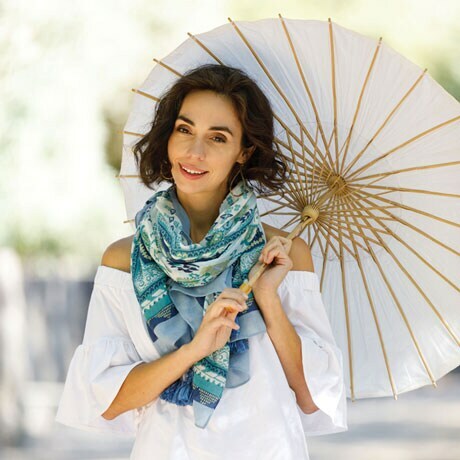 Decorated in an eye-catching pattern of crisp blues, greens, and whites, the generous 60"x44" wrap—with cotton tassels and a 31" slit— doubles as a scarf. It's a quick and stylish way to dress up a simple T-shirt or dress, or toss it over your bathing suit for a quick dash to the poolside snack bar!